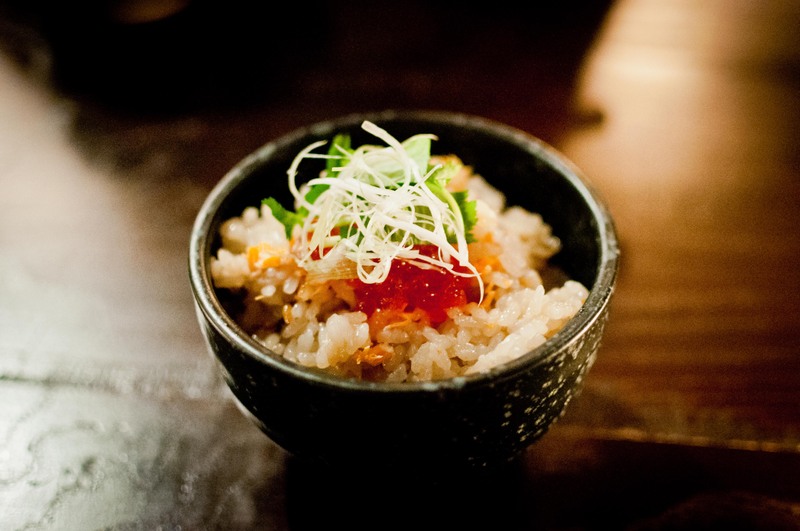 There was a recent article in the NYT about the newest additions to the Japanese izakaya scene in New York. This inspired VD, DC and I to seek them out one by one. 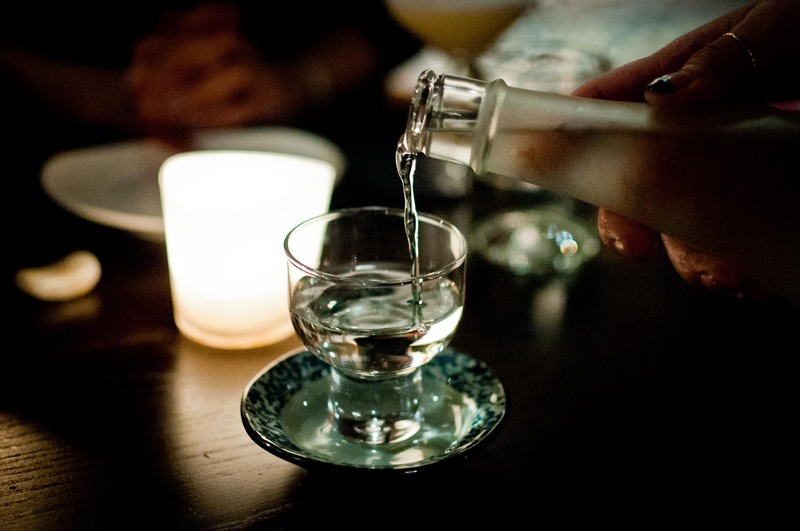 The first on our list was Sakamai in LES, a sake bar serving up some delicious bites that opened at the end of last year. The restaurant was spacious, something that is a scarcity in New York, especially in the Lower East. We were led to the back and seated right by a roaring fire which we needed on that rather chilly night. To help warm us up, we started with cocktails and sake and kicked off the meal. We were all drawn to the small plates section, skipping right over the snacks as well as the sashimis. The first of a series of dishes was a trio of croquettes. These little golden orbs were filled with lobster and lardo iberico might look small but they pack a great flavor. 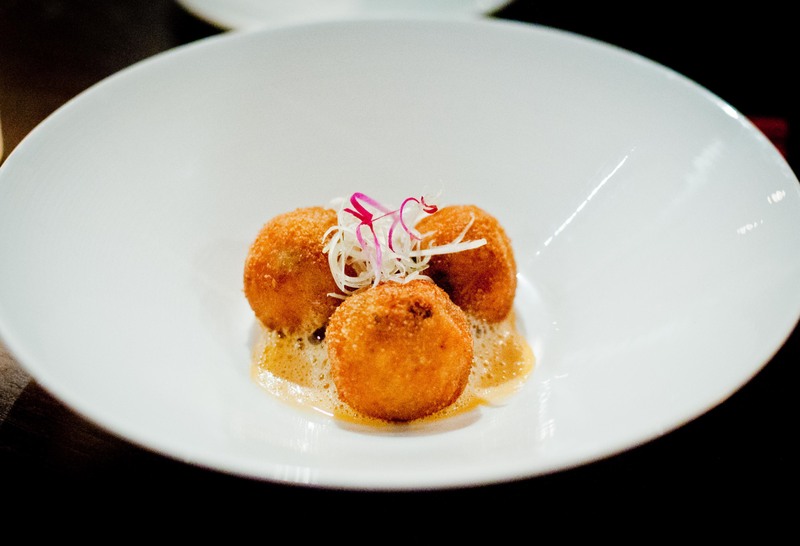 These rich croquettes were made even more luxurious with the miso and lobster bisque foam that they sat on. It’s not often we see fresh bamboo shoots on menus. 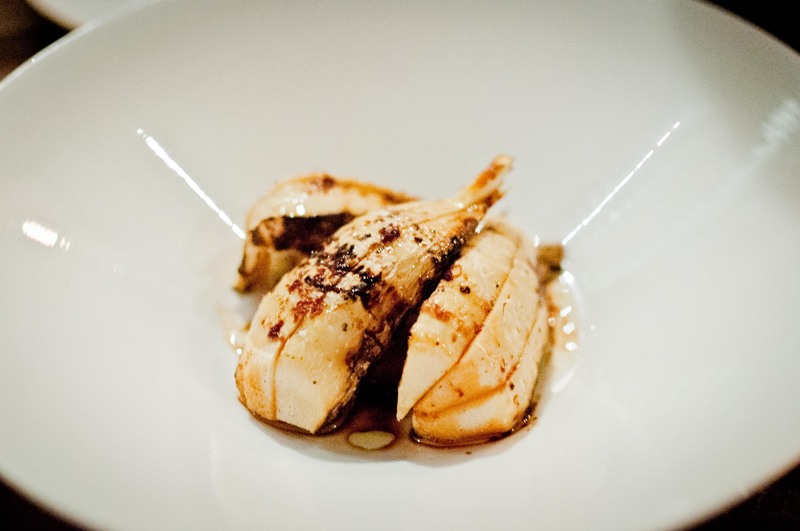 Sakamai served these hearts of bamboo grilled with a brush of ginger tamari and drizzle of extra virgin olive oil. The simple preparation accentuated the sweetness of the bamboo shoots and the peppery olive oil. Our next two dishes had one commonality and that was eggs. 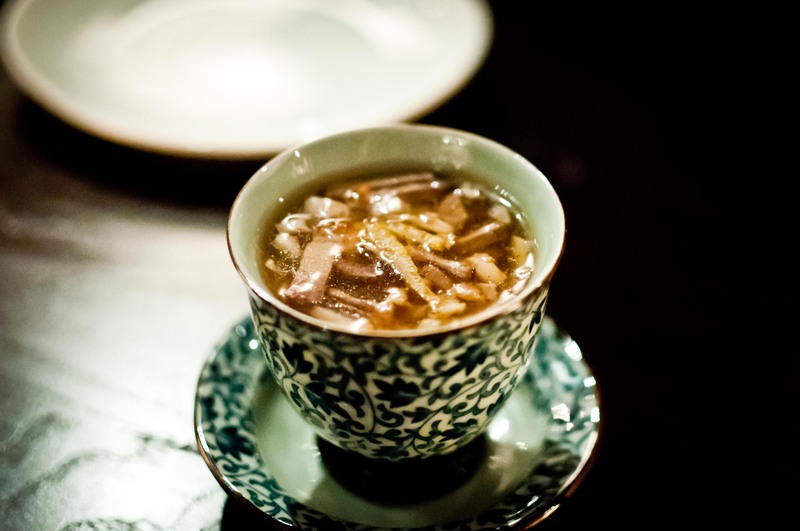 The first was a spin on the traditional chawan mushi, steamed eggs. Foie gras was mixed with the eggs and steamed until it was buttery and creamy. This was all topped with a dashi glaze, minced duck and oyster mushrooms. The portion was small and it made us treasure and savor each bite. The next small plate featured eggs even more prominently. In fact, the only ingredients were eggs – in 3 different forms! 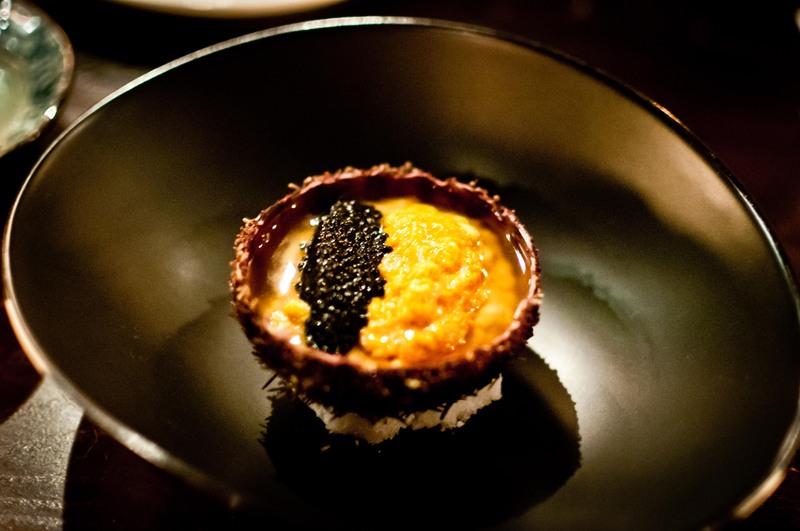 Served in a small sea urchin shell, the egg on egg on egg dish featured creamy buttery scrambled eggs topped with lobs of sea urchin and a generous scoop of white sturgeon caviar. The briny caviar was the perfect contrast to the sweet sea urchin. I only wish we can always have eggs in such a luxurious way. As with all meals at any Japanese izakaya, we concluded the savory portion with a rice clay pot . Sakamai offered two variations, both featuring mushrooms. 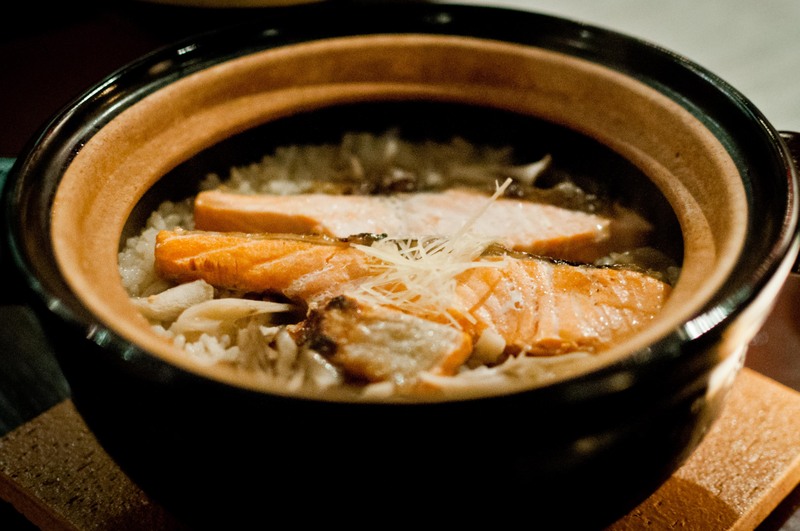 We chose the Tasmanian trout and mushroom clay pot which took a good 50 minutes to prepare. It arrived piping hot at our table just as we finished the small plates. Our waitress portioned out the rice for us and topped each bowl off with some bright ikura, mitsuba and Tokyo scallions. Delicious and hearty, this was a perfect way to soak up the alcohol. Finally, we officially round out the meal with a sweet treat. 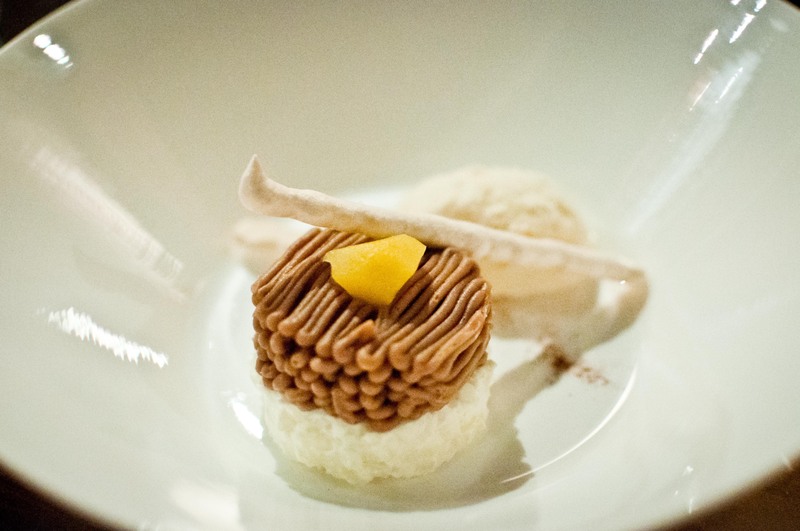 I love chestnuts and was ecstatic to see a play on the classic French dessert Mont Blanc. So much so that I didn’t even take a look at the rest of the menu. Sakamai’s take on the Mont Blanc included a rice pudding topped with creamy chestnut puree and a mascarpone ice cream and ginger meringue. None of the components were too sweet and was overall a well balanced dessert. Another bonus to dining at Sakamai is its convenient location in the LES, offering easy accessibility to more bars and clubs after eating. One Japanese izakaya off our list and many more delicious meals and drinks to look forward to and enjoy.